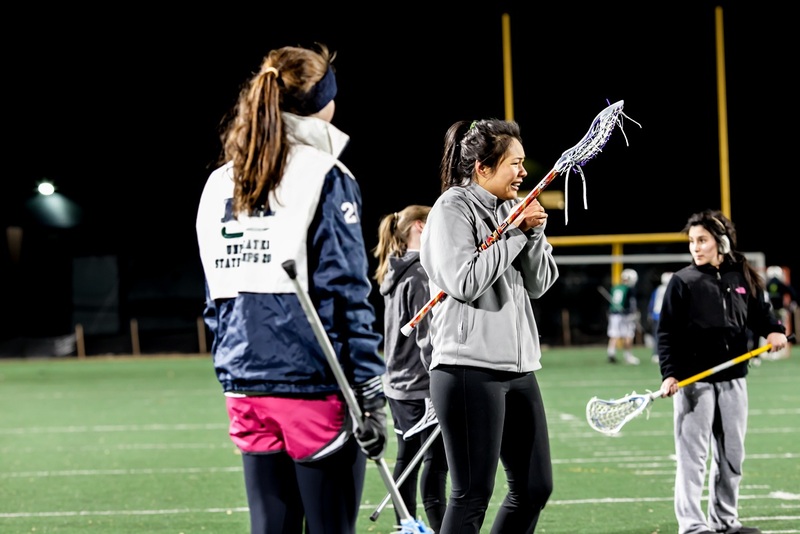 As night fell over Fairfax, the air was cold, but Mason’s Women’s Lacrosse club was starting to get warm. Mason hosted a round robin double header on Feb. 23 with central conference teams Salisbury University and Georgetown University. While the weather would not be doing them any favors, the team was able to make sound improvements in their game. Mason came out cold against Salisbury putting up only two points. For most of the players, this was their first game with the whole team and for some, their first game since high school. After a break, Mason collected themselves and turned up their offense. While their players were not meshing into a perfect fit, it was much improved from the grinding gears of the first game. Mason put up eight goals in their loss to Georgetown, a top team in the conference who will be a force to be reckoned with come this postseason. Mason showed a lot of power and potential at moments in the Georgetown game, but the young team’s lack of flow led to some struggles when they could not score quickly. “We haven’t had time to really connect and know how each other play yet. Also, we haven’t been able to practice any plays to make our offense faster,” Oglevee said. The few veteran players had a frustrating time compensating for newer players, who were not quite sure when and where to cut around the goal. However, during the second half of the Georgetown game, Mason’s players were catching on and making good use of their speed. Georgetown did pull away to win 16–8, but the Mason players were not disheartened. The two teams have a strong relationship that precedes their time in the conference. Mason also plays out of conference games against schools such as Richmond and VCU that serve as big learning opportunities without any potential danger to their post season. Getting as much possible play time in the spring is a big deal for these girls, especially in the beginning of the season. During the fall semester, the club participates in an open league through Marymount University and plays games without holding regular practices. This leaves a lot of learning and practicing to be done. Oglevee and Humphreys are not shaken by the cold start to the season. While the games showed some of their weakness, the weekend as a whole revealed their strengths. This year marks the first for the club with a chance at postseason, after their probationary introduction year to the Mid Atlantic Womens Lacrosse league. Current club president Courtney Oglevee helped the team make the transition last year to help develop the strength and quality of the program. “When I started playing club [my sophomore year], the group was very nonchalant and laid back,” Oglevee said. The club is five years old, and the first three years of play were organized with only a each games each semester and no official postsea- son establishment. teams mostly from Maryland and DC, includ- ing Georgetown University and Salisbury University. Both competitors are top caliber and showed the Mason team what they will be needing to focus on this season. “We’ve got to work on our defense, ground balls and transition. Fortunately, we know what we need to work on,” said club vice pres- ident Devin Humphreys.